Hosted by our friends at Gfinity, the Gillette Championship is a huge PES 2016 tournament which will see the top 24 players compete on PS4 for a whopping £15,000 prize pool. Taking place between July 8-9 at the Gfinity Arena in West London, the 24 finalists will battle it out over the two-day event in a bid to be crowned champion. 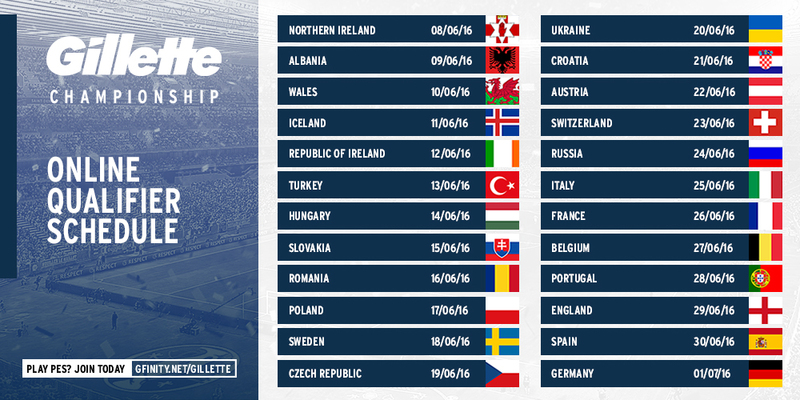 Choose a date, win the qualifier and you'll represent that nation at the Finals! If you do miss out on a Finals place, don't panic: you can still watch all the drama unfold by attending the event for free. This is the first-ever PES tournament at the Gfinity Arena and - with a live audience watching on - the atmosphere will be absolutely electric. And not only that, one lucky attendee will also take home a Gareth Bale signed matchball! Book your free tickets, join the Facebook event and give us a shout in the Comments to let us know you're going. I'll be there myself covering the event, so it'd be great to see some of you down there!